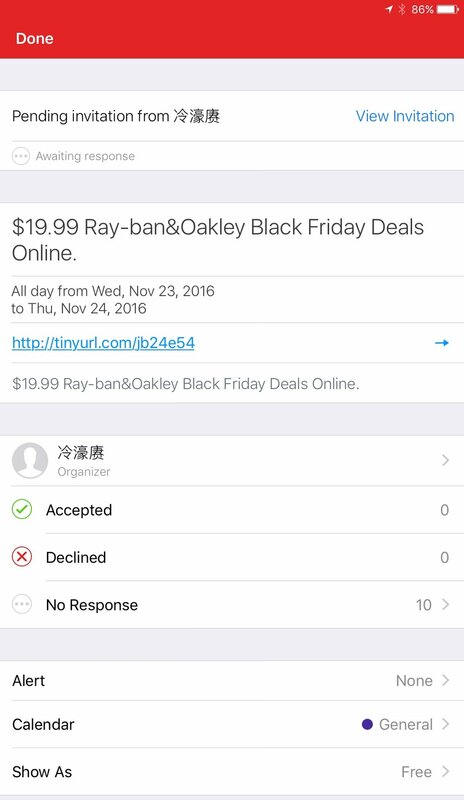 UPDATE Dec 11, 2016: Apple has updated the calendar app to allow users to report calendar items as spam, which will remove said spam from your calendar and alert Apple with details about the spammer. MacStories has a great article that goes into more details about these brand new features. I had a first this week...I received my first ever iCloud calendar invite spam. What the hell is that you say? Needless to say, I didn't create a calendar item to remind me to go buy Oakley or Ray-Ban sunglasses over the next couple of days. No, I was the victim of calendar spam. It's essentially email spam, but a lot more devious. You see, these spammers have figured out a weakness in Apple's iCloud calendar settings. By default when you are sent an invitation to your iCloud account it is automatically added to your calendar. For someone that isn't used to dealing with corporate calendar systems this is actually a really nice feature because you don't have to understand or even care about what a calendar invite is. That is until you get spammed. By selecting the "Email to" option you are turning off the ability for calendar invites to be automatically added to your calendar...now you get to choose. To be clear, by making this change to your iCloud calendar settings you are keeping this sort of thing from happening in the future. This doesn't get rid of your current calendar spam. I would suggest just leaving the spam event as-is so you don't alert the spammer on the other end that you are a valid and active iCloud account. With the changes you have just made, all future calendar invites you receive will come in the form of an email now. This does two things. It will give you the option to accept the invite (which adds it to your calendar) or ignore it (and it won't get added to your calendar). The other thing it does is it now exposes any calendar invites you receive to Apple's spam filters which will most likely block these types of invites. Go into the spam invitiation (or invitations if you are cursed enough to have multiple) and tap "Calendar" above the "Invitation From" section of the invite. Confirm that you want to delete the calendar by selecting "Delete Calendar"
Now pat yourself on the back because killing spam is hard work! Hopefully Apple will get on this and fix this loophole that spammers have started to take advantage of, because 10 steps to get rid of calendar spam is 10 steps too many.